It often strikes me that the top of the Hilton Hotel in Belfast looks very like a ship. Slightly further across the city, an enormous cruise ship backed into its berth on Monday morning. Unfortunately low level clouds arrived soon after, giving the passengers a traditional wet welcome to Northern Ireland as they boarded their buses to go off and tour the sights. It's an enormous vessel, with level after level extending above water level. Which makes me wonder what kind of hull and/or keel it was in order to keep its centre of gravity/centre of buoyancy in a sensible position? It's beginning to feel like a mini-series of iPhone app posts all inspired by Ewan McIntosh's blog! Today's post should start with the confession that I don't have an iPhone. Nor do I enjoy Sudoku. 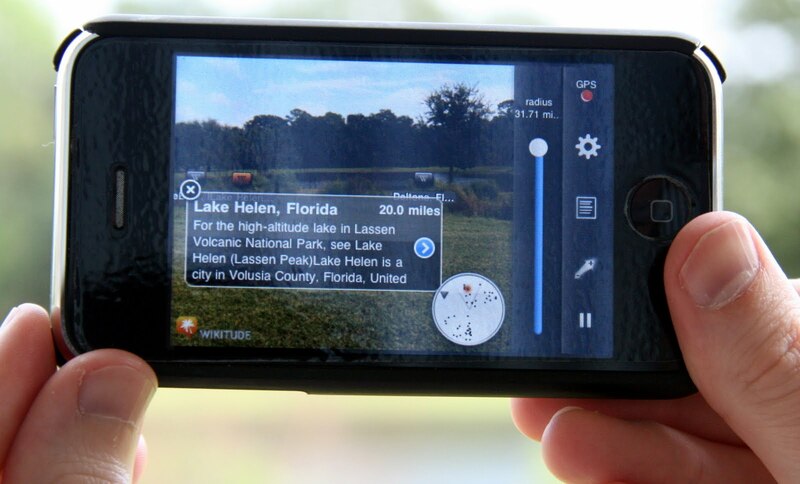 Augmented Reality is about superimposing electronic information over a view of the real world. Like a head-up display in an airplane cockpit or Terminator, or the cricket scoreboard that pops up mid-over to remind you of the state of play. By combining the real-time video image from mobile phone's camera with the GPS location, some applications can download pertinent local information and overlay it on the video feed on the phone's display. Useful for tourist information, or finding the entrance to the nearest Tube station. Bonus - It should really deserve its own post, but check out the video of The Shortest Possible Game of Monopoly too, and the story behind it. It's a book. It's an iPhone app. It's an iPhone inside a book. It's a kind of interactive book on which you can still turn the pages, but it also allows you to interact with the story. It's for kids. It has a touchscreen. It'll be hard to get out of parents' hands. It’s a new toy everyday! Today that seems to also apply to Google, who are continuously enhancing fully-released tools and releasing new beta tools for testing and evaluation. This is the company who reused their Google Maps implementation to create Google Moon! While I’ve long been familiar with the idea of customer overlays allowing you to add pins on top of Google Maps, until yesterday I didn’t realise that there was a built-in facility to display properties for sale and to rent. 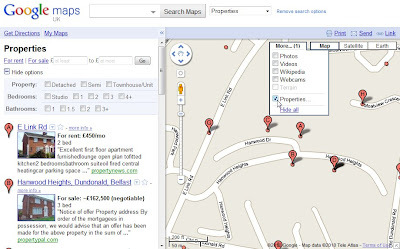 Google Maps are aggregating property information from two local online property portals: Property Pal and Property News (backed by the Belfast Telegraph). 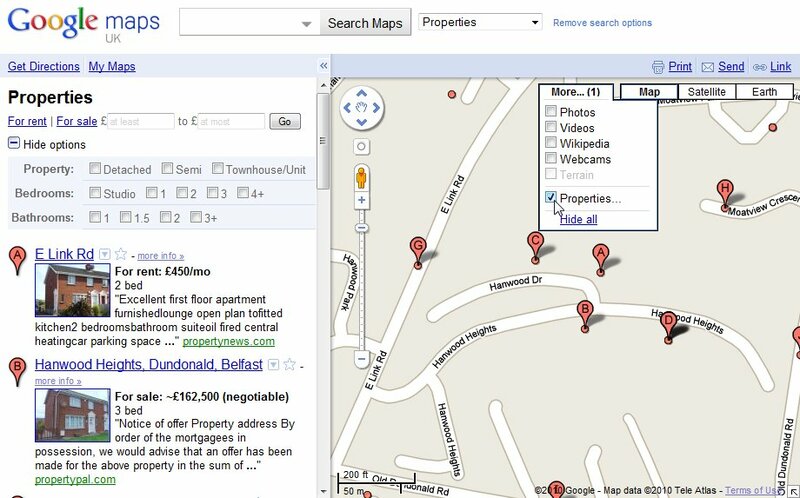 You just need to hover over the More button and tick the Properties option to automatically see properties available in your area. As I'm increasingly aware, Radio 4 is full of treats. This week's gift is a daily 15 minute programme, The History of Mathematics, presented by Prof Marcus du Sautoy. Daily at 3.45pm, he looks at the life of one or more mathematicians who have shaped scientific thinking. Today it was the turn of Newton and Leibniz. Like chicken and egg, which invented calculus first? Tomorrow it's the turn of Euler - after whom my first work PC was named! 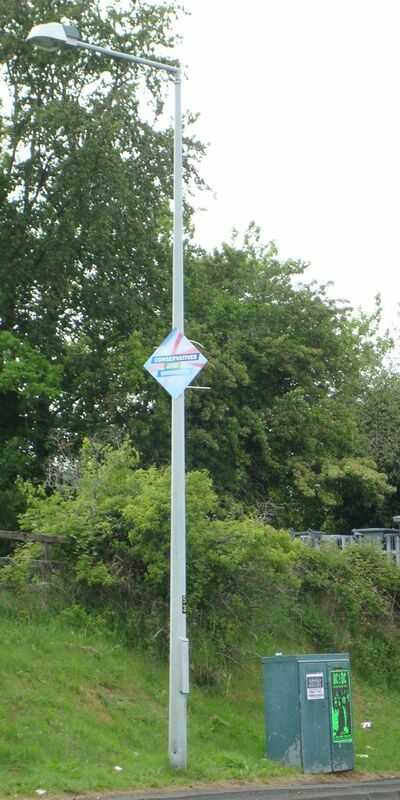 Five weeks after the Westminster election, and two UCUNF posters are still adorning lampposts on Lisburn's Belsize Road. On the roads that I'm daily travelling, they're the only visible remnant - other than cable ties - of the election. "The advertisement is removed within 14 days after the close of the poll in the election to which it relates." 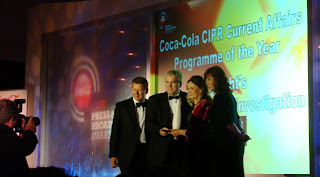 The Coca Cola CIPR Press and Broadcast Awards 2010 were held last night at Belfast’s Europa Hotel, celebrating print and televisual news/current affairs success in the local media industry. The evening also recognised host Bill Turnbull’s ability to keep the unruly crowd in order. 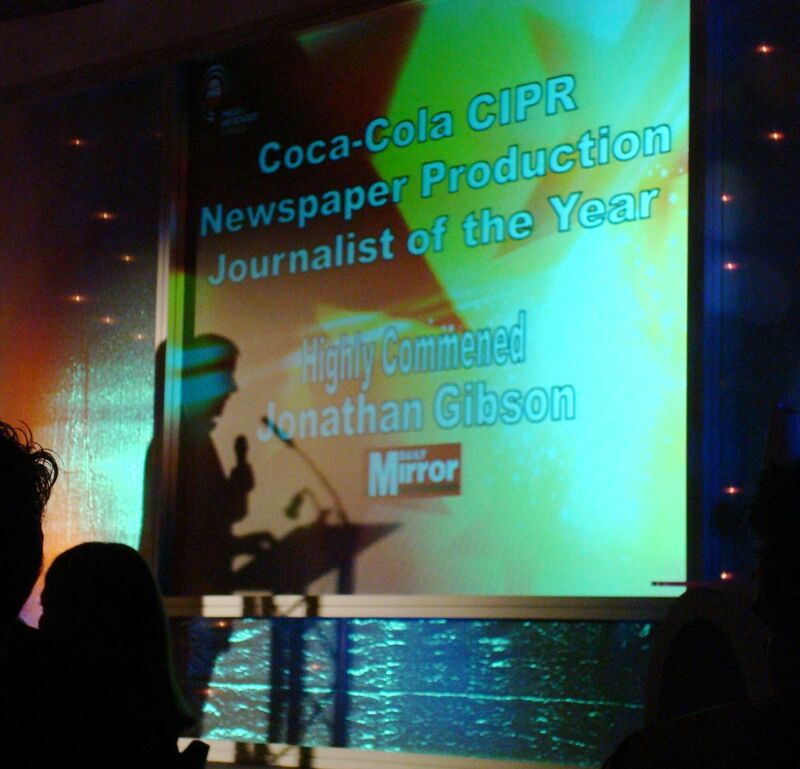 Darragh McIntyre and the BBC NI Spotlight team behind the Iris Robinson programme made periodic trips up onto the stage to pick up a succession of awards for Current Affairs/News Broadcaster of the Year, Current Affairs Programme of the Year and Scoop of the Year. UTV Live Tonight’s special on the Ryan Report won News Programme of the Year, and UTV‘s Blaine Scott was Cameraman/Crew of the Year. But the bulk of the awards went to print. The Belfast Telegraph’s Claire McNeilly won Newcomer of the Year and Specialist Journalist of the Year, and got a rousing rendition of “Take me to the church on time” in honour of her wedding today. It was a good night for the Irish News, picking up three awards. Difficult to tell whether the Newsletter were unlucky, or just hadn’t entered anybody. Not every category was sponsored and there was a feeling that the awards were being run on a smaller budget this year. Lots of craft and back room roles aren’t recognised at the awards - though the potential winners would probably scrub up as well in a tux or dress as anyone else. So nothing to cover picture editors or sub-editors (who fix reporters’ bad copy and help newspapers look professional). Deric Henderson from Press Association was a popular choice in the room for Print News Journalist as well as the overall Journalist of the Year awards, acknowledging his contribution to explaining Northern Ireland stories to national newspaper audiences as well as contributing to local titles. The Ballymena Guardian’s previous editor Maurice O’Neill was singled out for his Outstanding Contribution to Regional Newspapers. He was depicted as the driving force behind the title for a generation (or two), making his personal mark felt in North Antrim as well as any hapless chancers who thought he might be a soft touch! Finally Billy Kennedy came to the stage to accept his Life Time Achievement Award for more than 40 years working at the Newsletter. Retired, he still writes pieces and edits their Ulster Scots title. It was sobering to hear him recount the pattern of working during the most sustained periods of trouble. Sobering to realise how much the political and paramilitary situation was changed - and hence the news agenda - and yet, how many aspects remain suppressed but not eliminated. In a world before satellite trucks, 24 hours news, Twitter and blogs, the reporting of accurate information was in the hands of a small number of dedicated and talented hands. Nowadays, more people are involved, but the quality and depth has probably suffered. 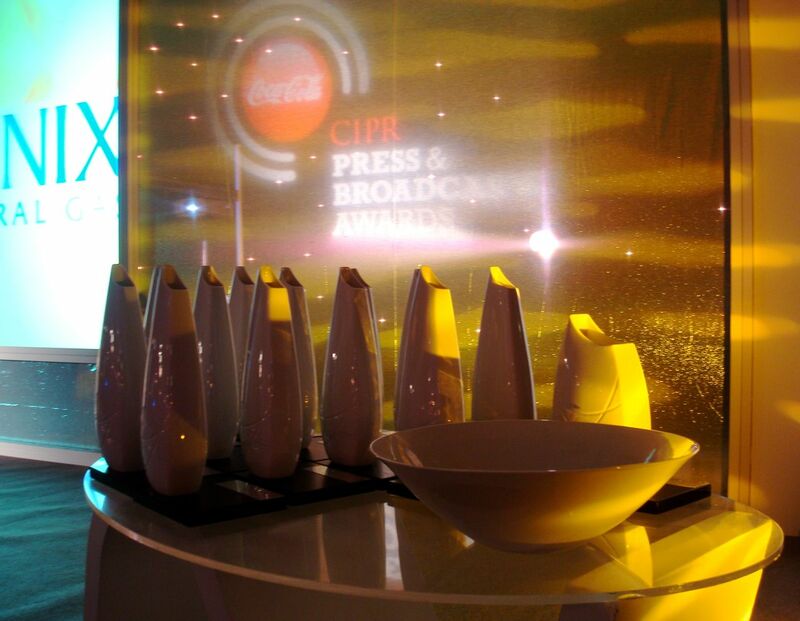 In twenty years time, to whom will the Chartered Institute of Public Relations be awarding prizes? With regional newspapers closing at an alarming rate, will the weekly print market be sustainable? One thing is for certain, there’ll be a few sore heads this morning in newsrooms around Northern Ireland! And someone in the event team will be learning to spell “commended” for next year. Open to local print and broadcast media, this new award aims to recognise excellence in the delivery of news and specialist content via new media including the internet, streaming audio/video, podcasts, mobiles devices, podcasting, videocasting, Twitter, Facebook and blogs. There will be two sub-categories – News and Specialist (strong editorial/commentary appealing to a targeted audience) – with the overall winner being selected from the two. Judges will look for the most innovative implementations and also those which have also brought commercial benefit to their business. Entries will be judged on the same date. To enter, we will need your website address, details of audience numbers; commercial viability, etc and all other relevant information to support your entry. Thanks to Phoenix Natural Gas who had sponsored the table I unexpectedly ended up sitting at. Bike Week starts in Lisburn on Saturday 12 June and continues until 25 June ... a fortnight later! 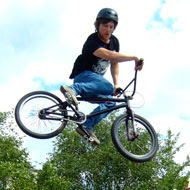 Between 10am and 4pm on Saturday 12 June, Market Square and Bow Street will host biking activities, face painting, a free bicycle limo as well as “a spectacular BMX stunt show”. Uncle Hugo Duncan will be entertaining crowds in Market Square from 11am to 4pm on Tuesday 15, with the Mayor and local councillors participating in a static cycling challenge in Smyth Patterson’s shop window. If you haven’t cycled for a while or want to start off gently, there’s a Beginners Cycle leaving the Island Centre Car Park at 6.30pm on Thursday 17 ands Thursday 24 that will be guided along the tow path to Drumbeg (for a snack) and back. An hour long family cycle along the tow path departs from the front of Castle House (opposite Castle Gardens) at 11am on Saturday 19, with a longer 2 hour 16 mile trip around Lisburn leaving earlier at 10am for more adventurous families. And from 10am to 4pm there’s a Midsummer Fayre in Castle Gardens complete with “a historic village ... demonstrating traditional skills, crafts”, face painters, banqueting food together with 17th and 19th century characters explaining the history of Castle Gardens. As an incentive to cycle to work, there’s a free breakfast in Market Square between 7.30am and 10am for anyone pedalling into Lisburn on Bike to Work Day (Friday 25). If your bike needs a once over, you can book in for a free health check between 12 and 19 June with Bike Week sponsor John M Hanna Cycles who are based at 11-15 Chapel Hill. Sadly, with a lack of joined up thinking, although Lisburn City Council is one of the sponsors of Bike Week, only the Midsummer Fayre is listed on their tourism portal at VisitLisburn.com. 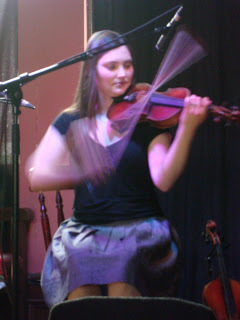 Toe tapping fiddler Zoë Conway is back in the Black Box on Thursday night at 8pm. Expect jazz, bluegrass, Appalachian and clouds of rosin in the air. It’s obvious now that God didn’t intend violins to be limited to being played on one string at a time, or for pizzicato to be purely the preserve of the player’s right handed fingers ... or for the four strings to be locked into being tuned to G D A and E.
"You'll probably want to blog it" said the guy who forwarded on a link to the video below. And he wasn't wrong! From the nice people at Inside North Point who aren't afraid to take a long hard satirical view of what they (sometimes) do. Always wanted to be a writer? Do you have a short story in you, waiting to burst out? If so, the Linen Hall Library would like to receive your 3,000 words along with a cheque for £5 before the closing date of 30 June to be considered for the Michael McLaverty Short Story Award. Entrants must have been born on the island of Ireland and be over 18 years of age. 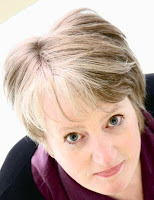 The judges – who are blind to the identity of the authors – are local author Glenn Patterson and Anne Tannahill, freelance editor and retired MD of Blackstaff Press. Oh, and the winner receives a prize of £2,000 and the story will be published by the Linen Hall Library. You can check out the more detailed rules on the Linen Hall Library website. Belfast Telegraph outsource fact checking to their readers? If this morning's online edition is anything to go by, then fact checking is a thing of the past at the Belfast Telegraph! ... and in a story about the PUP, you'll find that John Kyle is the interim leader, not David Lyle (though at least it rhymes). Long time readers will remember that one of my occasional hobby horses on the blog is finding similarities between built environment architecture and IT architecture. An invitation to Prof Ruth Morrow’s inaugural lecture at QUB a couple of weeks ago was another opportunity to ponder the parallels … as well as scoff some free nibbles afterwards. Officially titled Architecture as Provocation: Social Practice and Engaged Pedagogy, Ruth explored a variety of subjects in her hour long discourse. One of the early themes was Ruth’s insecurity about whether or not she was an architect. While she didn’t always fit the traditional mould, she felt she fitted in best when working with and in the company of other architects. One conclusion was that there is a need to widen the understanding of architectural practice (and perhaps stop seeking to exclude people who offer architectural skills in novel contexts). One shocking statistic she shared was that only 28% of people who start Part 1 Architecture reach Part 3 and enter practice. 72% disappear. Speaking to a few post-grad students and qualified architects afterwards, they were largely unattracted by the idea of designing porches and utility room extensions, but came across as a lot more passionate about making the world a better place by seeking to apply their trade to communities and industries, rather than houses and single buildings. Later on there was reference to clients who have the power and the money, but are vastly outnumbered by the users of a building or development. 98% of the population have no access to the architect. Their conflicting and divergent views are often not listened to. Yet the success of the project relies on those who ultimately inhabit and fit into the new structure. The same ratio and responsibility is true in the world if IT, with clients paying for deliveries, but users likely to provide additional insight and colour in order to get a full perspective of the context for the work. And there are the same overarching societal concerns. Enterprise architecture often has wider goals and constraints, often preventing the over-diversification of technology and seeking opportunities to make the first steps towards a longer-term strategic goal by exploiting the current clients’ shorter term wishes. Ruth suggested that architects needed to “work hard to reach and serve the 98%; work politically and strategically; open up the design process to others”. She also opined that a lot of projects were only designed to fit “white healthy males between the ages of 17 and 35”. Ask relatively new first year architecture students to define an architectural curriculum and they include nearly everything except people and design. They seem to assume that their own humanity means they understand everyone else’s, and they think that design cannot be taught, despite it being an improvable skill. In amongst the theorising, there was a practical instruction: “sustainable creativity means reusing detail job after job”. Just like IT, there is no point reinventing everything from scratch every time a new project comes along. If a particular element was good last time, reuse it and concentrate your creativity on the novel parts that need original thought. Ruth’s background is varied, and she keeps many fingers in many pies. 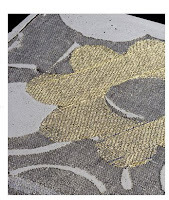 As well as chairing PLACE (the Architecture and Built Environment Centre for Northern Ireland), she’s co-director with Trish Belford (senior textile research fellow at University of Ulster) of Tactility Factory which is designing surfaces that are a fusion of concrete with softer tactile fabrics and textiles. Working at Tactility, she’s become aware that “research develops complexity in understanding” while commissions are “defined by success” and “simplification to get it delivered”. IT projects – which historically come of the rails faster than a Scalextric car speeding around a corner – requires a pragmatic architecture that can’t possibly detail every nuance and feature to the nth degree. 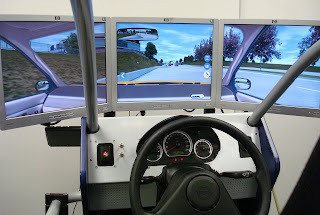 Some level of simplification is required to move the design from academical to reality. Ruth was sad that architects have become so removed from the fabrication process. Again this echoes the need for software architects not to lose the skill of putting their noses against the codeface. Architecture students at QUB have to participate in Live Projects under the banner of The Street Society: intense, week long opportunities to engage with real clients on real projects; teaching them about pace, level of production, bravery, and perhaps most importantly “completion is more important than perfection”. Sounds like what our CIO used to call a hot house. No doubt people will comment to correct me, but I’m not sure IT architecture has many architectural heroes to look up and study as our built environment colleagues, Prof Ruth Morrow is a definite student of collaborator with fan of Leon Battista Alberti. Thanks to flâneur James Brown for the tip off about the lecture. As well as his personal blog, you can find his musings on his PhD and Live Projects over at Learning Architecture. 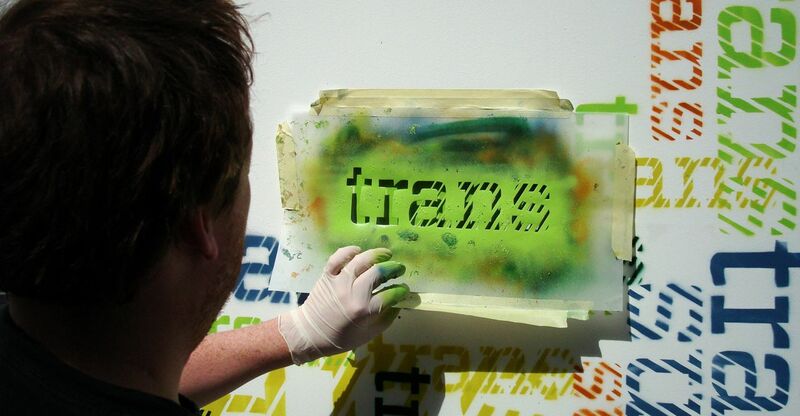 This summer’s Trans Festival was launched yesterday and as usual features music, street art, exhibitions, films and courses. Urban Arts Academy is once again offering courses for anyone over the age of fifteen who is interesting in immersive training by practicing professionals in photography, radio production/podcasting, journalism, game design, developing iPhone apps (shorter course available too), documentary film making, free running, stop motion animation, puppetry and lots, lots more. Get your places booked early as it tends to sell out. There’s oodles of music throughout the three weeks of the festival. Saturday 17 will see the Waterfront’s Penthouse Bar replace chart hits with booming classical music in the night club setting of Classic Music unBound: “We’ll be mixing Mozart, chopping Chopin and back- beating Bach, while a live string quartet will be keeping it ‘old school’ with two centuries of classical favourites”. There’s always something unexpected with Trans, something of the organisers’ personalities running through the programme. 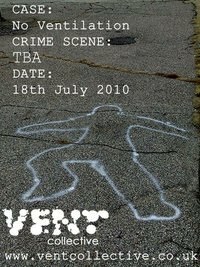 Last year’s Scavenger Hunt is back with a twist. This time there’s no mass organised Sunday afternoon event, but Alternative Ulster have composed a brand new treasure trail around Belfast city centre based on local new music icons. Download the PDF, solve the clues, collect all the badges, and then download free tunes from the featured artists. The Waterfront’s Penthouse Bar goes all Wiff Waff on Tuesday 6 July as it hosts a round-the-table ping pong tournament. On Tuesday 20 July, it’s the turn of Championship Gaming where you can “embrace your inner nerd and compete with like-minded children of the 80s and 90s in a knockout battle of classic Nintendo greats and their modern-day successors. There will be Mario Kart, Rock Band, Pro Evo and more, with competitions and super prizes and awards”. There’s an Electronic Crèche with Sunday newspapers, magazines, wifi and Wii games in the Crescent Arts Centre between 1-4pm ion 4, 11 and 18 July. Black Market (artists, illustrators, crafters, stalls, vintage clothing)is in the Black Box on Sunday 4 July, and Black Books (books, magazines, comicbooks, children’s literature) is back on Sunday 18 July. The QFT is coming to the Group Space upstairs in the Ulster Hall for a week. George Lucas’ sci-fi cult hit THX 1138 is being performed live on Wednesday 14 July. Electroma (the odyssey of two robots on their quest to become human) is playing on Thursday 15 July. 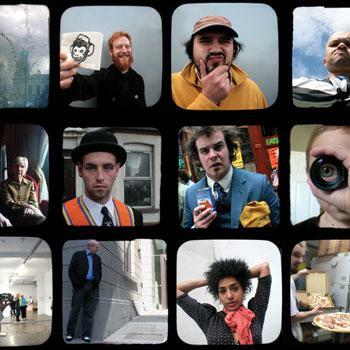 Friday 16 July’s treat comes in the form of the showing of Le Donk & Scorz-ayz-ee, a no-budget mockumentary film made and shot in five days “following the day to day life of Le Donk, failed father, second-rate roadie, aspiring music mogul and one of the most monstrously funny characters you will ever see on the big screen”. Running from 5-24 July, Moochin Photoman has an enormous exhibition of his Through the Viewfinder portraits upstairs in the Waterfront. On the final evening of the exhibition, visitors can choose their favourite photo from the thousands on display and take them home for free. Elsewhere in the Waterfront, there will be another photographic exhibition, this looking at Youth in the Media which promises to “portray the stereotypes with which young people are currently labelled and addresses how they should be portrayed: as articulate, intelligent, hard working and caring”. Whether personal or organisational, there is significant speculation that there were UVF links to the brutal murder/public execution of Bobby Moffett on Belfast’s Shankill Road last week. Subsequently there has been a lot of discussion about intimidation and local people not feeling free to attend his funeral. 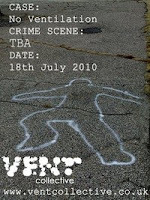 While no one really believes that Belfast’s streets are entirely free of guns, the widely understood rules of the decommissioning game seemed to state that no organisation should be caught taking them out from underneath their floorboards and using them. But those involved in Moffett’s murder seemed to be deliberately ignoring that custom. 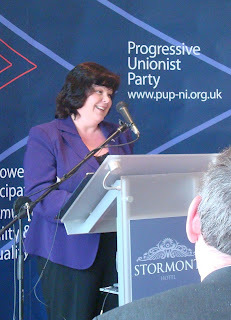 The murder and community intimidation put enormous pressure on Dawn Purvis as leader of the Progressive Unionist Party. When talking about her politics, she speaks about improving conditions in working class areas of Belfast, addressing educational underachievement and poor levels of literacy, campaigning for the extension of the Abortion Act to Northern Ireland. It’s about moving forward, rather than being dragged back into past conflicts. “I make this decision with a very heavy heart. I believe the Progressive Unionist Party was founded by individuals who had a real vision for Northern Ireland and a positive and important contribution to make to politics and the peace process in this country. I have been honoured to be a part of that. However, I can no longer offer leadership to a political party which is expected to answer for the indefensible actions of others. I will continue in my role of MLA as an independent member of the Assembly, representing the people of East Belfast. Councillor Dr John Kyle has been appointed the interim leader of the PUP. But with no representative in the Assembly, and unless the party can finally lose the baggage of being perceived as the political mouthpiece for paramilitaries, the PUP’s plans to run candidates across Belfast in the 2011 council elections may lack credibility in the eyes of the electorate. The question is whether the distinctive political vision of the PUP (that grew out of David Ervine’s experience) can be kept alive and perhaps moved under a new banner to keep a focus on communities that are often overlooked and disenfranchised by the larger parties? I interviewed Dawn Purvis last November as part of a series of posts looking at local East Belfast political representatives, and asked her about how she got into politics. “I was never attracted into the world of politics. Politics was a big turn off for me because I heard large men with booming voices and from a very early age I thought they had nothing to offer to this society and were never going to resolve the difficulties. So from a very early age I always thought that it was those who were doing the fighting and those who were committing the violence that had to sit round the table and had to sort out their difficulties. And that’s what needed to happen and it did happen. And I suppose becoming involved in community work, mother and toddlers, after school club, and actually working in the community when my kids were small, when I started to realise the very great need that was there, that’s how I became headhunted by the party if you like. And that’s what the PUP does. It recognises talented people and said we need people like you in the party who are working at the coal face for some of the most vulnerable. And a friend of mine headhunted me into the party. And I have to say that where I am now, if you’d said to me in late 1994 this is where you’re going to be in fifteen years’ time, I’d’ve probably been looking two GPs to get you signed into Knockbracken! 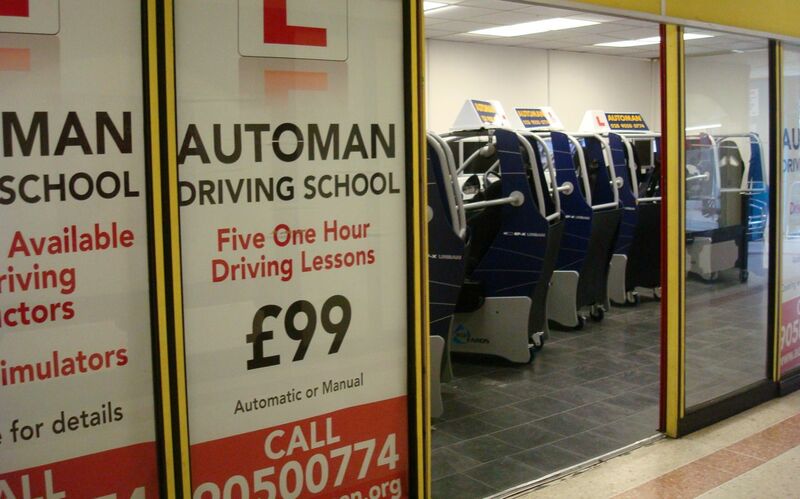 Learn to drive in a simulator? Is Belfast ready? The second hand book shop in Belfast's In-Shops arcade - the one that stocked Peter Robinson's novels! 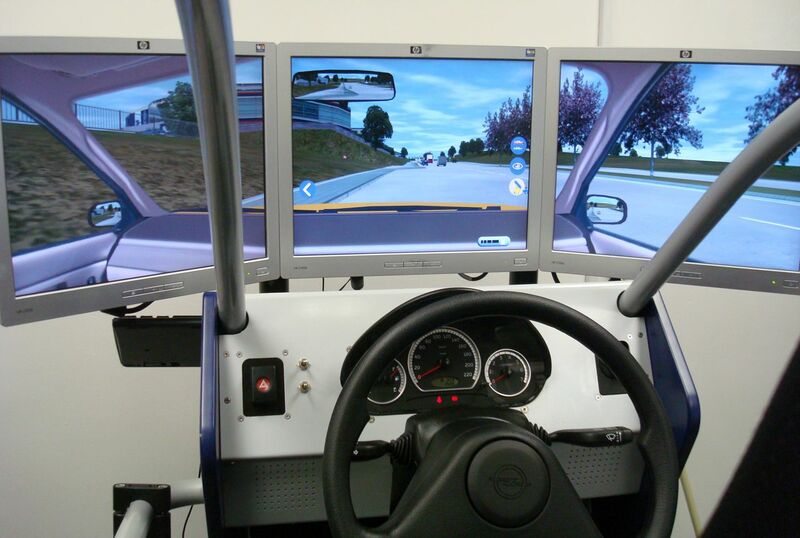 - has been replaced with a driving simulator franchise! 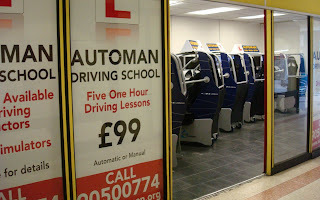 Five lessons for £99 at the Automan Driving School. Not going to put a lot of money on this trader lasting longer than the last occupant of the unit.